Each of these sweet chicks is completely edible. They can be made using pure white chocolate, if you are experienced with tempering chocolates, but can also be made using confectionery coating/candy melts. You'll create a hollow chocolate ball, using a round plastic ornament as a mold. 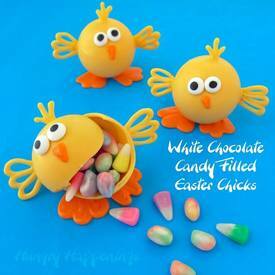 Each chocolate ball can be filled with any type of Easter candy you like. Then you will pipe wings, feet, feathers, and a beak and attach them along with some candy eyes to the ball.